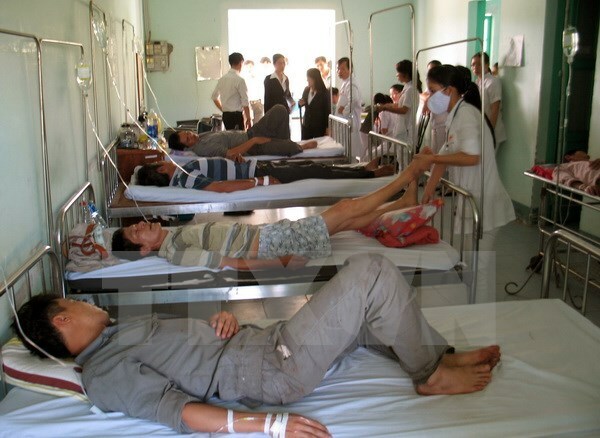 HA TINH (VNS) — As many as 23 construction workers were rushed to the hospital after they reported symptoms of food poisoning in the central province of Ha Tinh. Workers from China's 6th Chemical Construction Company in the Vung Ang Economic Zone in Ha Tinh Province's Ky Anh District reported symptoms of stomach ache, vomiting, dizziness after having dinner at the company canteen yesterday. They were transported to Ky Anh District's General Hospital for treatment at 5.30pm. As of 10.30pm on the same day, 22 out of the 23 workers had been discharged. As soon as they were informed about the news, Ha Tinh Province's Health Department authorities coordinated with the food administration, and Ky Anh district's preventive medicine centre arrived at the company canteen and take samples for further investigation.